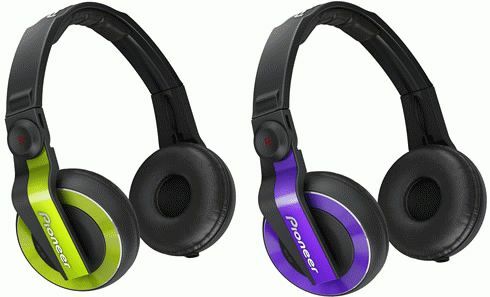 Pioneer DJ is adding two new color versions of its popular affordable HDJ-500 DJ headphones, a vibrant green (HDJ-500-G) and a brilliant violet (HDJ-500-V). The new color options offer listeners the same exceptional fidelity, comfort and affordability as the current black, red and white HDJ-500 models. Consumers now have multiple colors to choose from, a perfect complement to Pioneer’s recently introduced DDJ-WeGO compact DJ controller, available in the same five stylish colors. The new green and violet colors expand consumers’ ability to express their personality and style through their headphones. By combining 40 mm diameter drivers, a thick 19 m (micrometers) diaphragm and a copper clad aluminum wire (CCAW) voice coil, the headphones efficiently reproduce the lower frequency audio range, which is critical to mixing. Kick and snare drums sound clearer, making it easier for beginner DJs to match to the beat of tracks. Designed for durability, the main structure of the headphones is made with magnesium alloy for a lightweight feel and toughness. The HDJ-500 also uses comfortable urethane pads wrapped in quality leather, allowing the headphones to model around the user’s head and ears for a snug and slip-resistant fit, providing great feel and ideal for long periods of use. Each HDJ-500 features a rotating arm structure that allows users to rotate the right earpiece forward and back by as much as 60 degrees. Combined with the flexible headband, at this position there is enough side pressure to allow the user to listen to audio playback on one side of the headphones, providing maximum flexibility during performances. The simple and stylish design of the HDJ-500 headphones has been modeled after Pioneer’s flagship HDJ-2000 professional DJ headphones, including the shape of the headphone hanger that allows the orientation of the headphones to be identified quickly and easily. The HDJ-500-G and HDJ-500-V headphones will be available at the end of December 2012 with a suggested retail price of $125.